“La mamma è sempre la mamma” the Italian expression goes: mum is always mum. And yet mothers die. 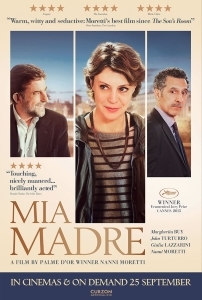 Director Nanni Moretti’s new film Mia Madre (2015), which first premièred at this year’s Cannes Film Festival, is a meditation on imminent grief and the loss of a mother. Margherita (Margherita Buy) is a stressed modern woman, balancing her career as an established film director, her family commitments – she has a daughter, custody is shared amicably with the father – and the recent illness of her mother. She’s in the latter stages of a break up with one of her actors. She spends her days on set making what looks like a fairly tired and clichéd political film about a labour dispute. In the evening, Margherita visits the hospital where her ailing mother, Ada (Giulia Lazzarini), is being cared for by her attentive brother, Giovanni (Moretti), who brings home-cooked meals and a teasing sense of humour to comfort the anxious old lady. Unwilling to fully confront her mother’s condition, Margherita consoles herself with a wilful ignorance, complaining that the doctor isn’t being clear where in fact the message, though couched in sensitive euphemism, is grimly obvious. Margherita’s world is made all the more difficult with the arrival of a noisy and annoying American actor Benny Hemmings (John Turturro), in what appears to be a holiday mood letting his ham hang out. As she confronts her mother’s mortality and asks questions of her own life, she’s haunted by memories of the past. Moretti has made half of a wonderful film. Margherita’s relationship with her mother, freighted with guilt, fear and vulnerability, is beautifully played by the two actors, eschewing sentimentality for a bolder, more honest look at losing a parent. Part of Margherita’s guilt comes from the fact that even her mother’s imminent death is inconvenient, just another unreliable element of her life to be factored in with bursting washing machines, incompetent crew members and her daughter’s school work. Ada, for her part, is bored of her illness but also increasingly unsure of herself and her own memories. A former schoolteacher, Ada is loved by her students and family – the relationship between her and her granddaughter is particularly exquisite. This is all conveyed in light pencil strokes of startling precision and simplicity. However, this delicate human drama – reminiscent of Moretti’s Palme d’Or-winning The Son’s Room (2001) – is constantly interrupted by the altogether ordinary and often unfunny satire on making a film. The ugly American is such a tired and easy cliché that Turturro can be forgiven for trying to liven it up with some grandstanding. His role as the wicked factory boss in the film within the film compounds the cliché. It would be difficult to contradict the veracity of Moretti, who lost his own mother while filming We Have a Pope (2013), but all the filmmaking moments feel surprisingly false, contrived merely to give Margherita something to react against. Likewise, the dream sequences also feel indulgent, confusing and basically not like dreams. Nobody dreams in ways that are so narratively pertinent. Mia Madre is an intimate and sincerely made family portrait, which ends up betraying its own indifference to anything beyond the confines of the family.